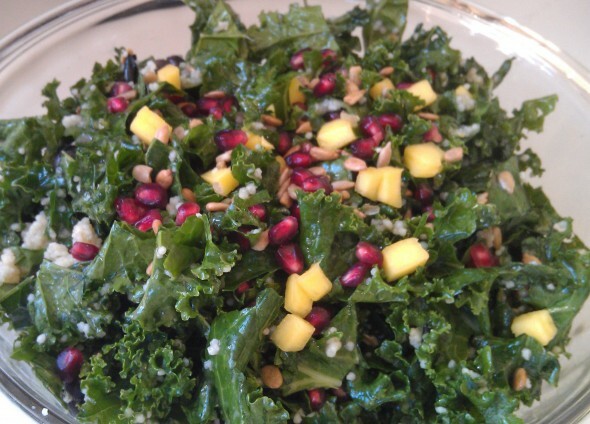 I love, love, love this easy kale salad. I love the texture the sunflower and pomegranate seeds add to it. I love the substance from the black beans. I love that it is very nutritious and guilt free. I've made it four times now; for myself, my omnivore household and for a potluck. Each time it has been a hit. With the couscous and black beans,it can stand alone as a complete meal or a side. This showed up as a recipe in my CSA box, chelseasmessyapron.com is credited as the source. The original called for mango, which also works great, but since we are in pomegranate season now, I use pomegranate seeds instead so that it is more of a localvore dish. You'll be surprised how these steps transform kale into something very edible and tasty. If you still need some help, below is a YouTube video that explains how to prepare raw kale. Locate the ridges and make cuts along those ridges where you are just cutting the skin of the fruit and not into the seeds. Don't worry if you don't see the ridges, just make several vertical cuts from top to bottom. while submerged, peel and separate the seeds from the chaff. The seeds will settle at the bottom while the chaff will float to the top, making for easy disposal. Pomegranate season in the northern hemisphere runs from September to February and uncut pomegranates will keep up to a month. Chop or tear kale in bite sized pieces. Prepare couscous according to package, I usually add a teaspoon of olive oil. Peel a pomegranate as described above. If the pomegranate is large, reserve about a third of the seeds for a separate snack. You can serve this right away, or it will keep in the refrigerator for a few hours. Enjoy!